Few new lows but a good deals to pick through in Green Man Gaming 2K and Rockstar games today. NBA 2k19 for $16, BioShock Collection for $12, Grand Theft Auto V for $12 and more all near cheapest ever price points. Up to 90% off Ubisoft Titles this week at GMG. New lows on Anno 1800, Eagle Flight VR, Watch_Dogs 2 and more. Other notable titles near their all-time lows are Assassin's Creed Odyssey, Far Cry Primal, and Assassin's Creed Origins. GMG has kicked off a new round of sale, this time with basically every modern title from Ubisoft's giant catalog. Pick up lowest ever price on popular franchise, include newer titles such as The Crew 2, Far Cry 5, and more. Historic low price also on Fractured But Whole and Rainbow Six Siege. Uplay keys. It's back! Ubisoft titles are all on tap again at Green Man Gaming for up to 82% off. Pick from Assassin's Creed: Origins, Far Cry 5, South Park: The Fractured But Whole, Tom Clancy's The Division and more. Ubisoft titles up to 78% off during GMG's March Madness Sale. New lows on Assassin's Creed: Origins, Tom Clancy's Ghost Recon Wildlands and For Honor. Also near all time lows on South Park The Fractured But Whole, Steep, and more. Be sure to click "Add to Basket" to see the final price. New lows on AC Unity, Valiant Hearts, Child of Light, and more in GMG's new Ubisoft Sale. Hot prices also on Tom Clancy's The Division and Rainbow Six Siege. Green Man Gaming is running a large Capcom publisher sale with tons of games on tap. A few titles are at lowest ever price, including Capcom's Beat 'Em Up Bundle, Devil May Cry HD Collection, and Street Fighter 30th Anniversary Collection. All Steam keys. Sale ends later this Thursday morning. You'll have to login and add to cart to see full discount. Login required for max VIP discount. Cheap Resident Evil, Dead Rising, and Devil May Cry series in Green Man Gaming's Capcom sale. Discounts up to 80% off. New low on Dragon's Dogma Dark Arisen. Capcom titles are cheap this weekend at several PC gaming retailers (like GamesRepublic) - up to 75% off. GMG takes the cake though with the same instant savings as everywhere else but a stacking 20% off coupon to boot. Remember Me is only $4.80, DMC: Devil May Cry only $7.92, and Ultra Street Fighter IV only $12 - all at or basically at their lowest prices ever. New lows on Battletech, ELEX, Hitman 2, Quantum Break, Stellaris and more in GMG's Paddy’s Day Deals. Deals valid until Monday morning. Final Fantasy titles and a few more Square Enix games are 55% off instantly at GMG this week. New lows on Dragon Quest XI Echoes of an Elusive Age, Romancing Saga 2, World of Final Fantasy and more. New lows on Deus Ex Human Revolution Director's Cut and Dungeon Siege Collection in GMG's new Square Enix Sale. Decent prices on Just Cause, Deus Ex and Tomb Raider series up to 80% off. All Steam keys. New lows on Just Cause 4, Deus Ex Mankind Divided, Dragon Quest XI Echoes of an Elusive Age, Shadow of the Tomb Raider and more in GMG's Holiday Square Enix sale. Get up to 80% off instantly and there's a 12% off coupon running that stacks for additional savings. Update: Things just got cheaper! Final Fantasy, Deus Ex and more titles are all on sale in GMG's March Madness Square Enix promotion. Discounts are up to 80% off when added to basket plus after using 20% off coupon PAYDAY20 - worthwhile deals to consider: Final Fantasy XIV, Deus Ex: Mankind Divided, Life Is Strange: Before The Storm, Just Cause 3, and of course Sleeping Dogs Definitive Edition. Big update on the GMG Square Enix sale. GMG has launched a 5% off coupon code slashing price even further. Even further new lows on Rise of the Tomb Raider 20 Year Celebration, Deus Ex: Mankind Divided, The Turing Test, Just Cause 3, and more. Cheapest Goetia and Kane and Lynch 2 in GMG's new Square Enix sale. Decent Summer-Sale-Like prices on everything. Tomb Raider GOTY down to $6.79, Just Cause 3 $28.79, and Deus Ex: GOTY $1.57. New historic low price on Wolfenstein II: The New Colossus, Elder Scrolls V: Skyrim Special Edition and more (7 new low price titles) in GMG's Bethesda weekend sale. Deals valid through March 6th at 8am Pacific. The cheapest Elder Scrolls Online: Morrowind and more in GMG's Bethesda week sale. Also near all time lows on Elder Scrolls Online: Morrowind Digital Collectors Edition and Fallout 4. New low on Prey plus March Madness sale pricing on Dishonored, Wolfenstein, Fallout, Doom, and more Bethesda titles in GMG's Bethesda sale. The sale got a boost today with a new 20% off coupon, stacking on top of existing instant savings. We're now counting 11 titles at historic new low price. The cheapest Dishonored 2 and more in GMG's Bethesda sale. The discounts have been going for almost 2 weeks now but ends tomorrow morning. About 24 hours left for those in search of cheap Skyrim, Doom, Fallout 4, The Elder Scrolls Online, etc. It died yesterday, but is apparently back? GMG's Bethesda sale with the chepeast Doom and Fallout 4 to date live again. The cheapest DOOM and Fallout 4 in GMG's Bethesda sale. Very impressive PC download offers with instant savings + a stacking coupon code. Green Man Gaming is running a giant Lunar New Year Sale with over 600 titles on tap. We picked out the best deals from the sale, from AAA to indie titles. Almost everything on sale are Steam and Uplay activated titles. Tons of games are on sale in GMG's Lunar New Year Sale and for ease of browsing we've group some of the larger publishers separately. 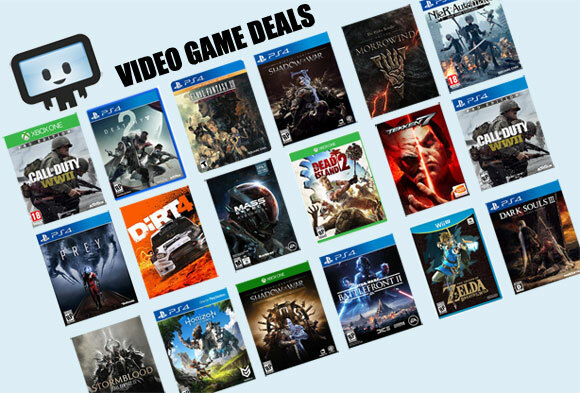 Thus far we've spotted 36 great deals on Bandai Namco titles, with new historic low games being Soulcalibur VI, SAO: Fatal Bullet, and Ni no Kuni Prince's Edition. All Steam key.